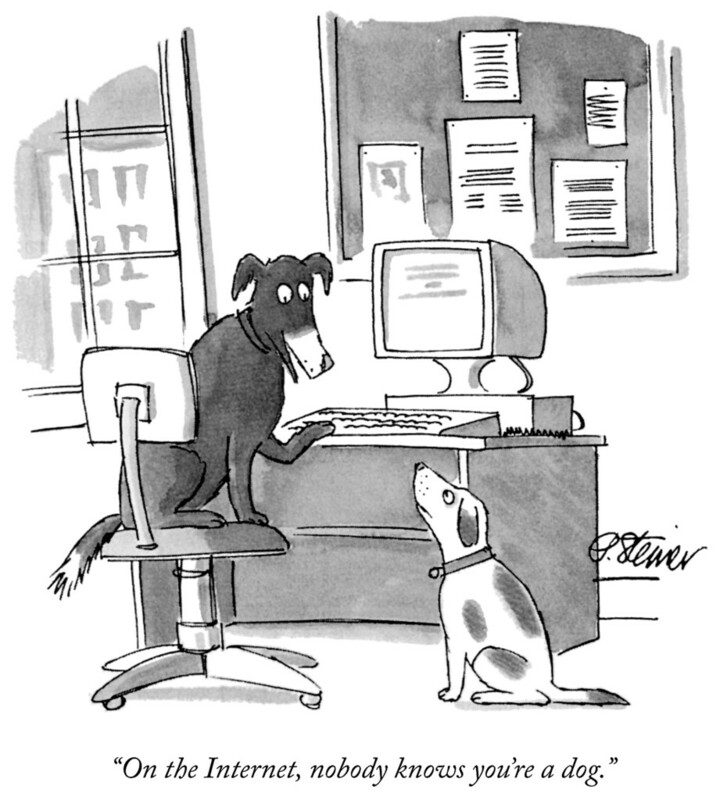 On the internet, nobody knows if you are a dog or exists at all. The graphic is a Peter Steiner’s cartoon, which originally was published in The New Yorker. You can compare a world where there seems to be more than one to an online world with nothing but robots. It might sound potentially interesting to communicate with them and hear about their experiences of the world. The problem though is, that not only do they try to persuade you into believing that their world is real, but also that they are not robots. But as there is no more than that which is one, since it is formless and therefore endless, there is neither an online or physical world. Thus you have been fooled by non-existent creatures if you experience to be in any kind of world, whether it appears to be physical, spiritual and whatnot. It takes two, however, to be fooled, so you can only be fooled because you want to believe, it is possible to be and have more than that which is one. The moment, you do not want to be and have more than that which is one, there is no need to believe, the apparent differences in the world where you appear to be someone definitive make a difference. As that means you cannot be defined as someone at all, there does not appear to be something hiding the formlessness of oneness. The way to not want to be and have more than that which is not one is not to stop the desire for more, as that would imply it is possible to be and have more than that which is not one. Instead, you fully include the desire to be and have more, and as a desire – just like everything else experienced – needs a contrast to be felt as something specific, including it will also include its contrast, namely the disgust of being and having more than that which is one. Inclusion excludes separation and without separation, there is no more than that which is one. Hence you neither avoid or go for being and having more than that which is one. Not because you have seen it is futile, but because the inclusion of a contrast cancels it out*, so the idea that it is possible to be and have more than that which is one is undone. You are defined as someone definitive by what you exclude. In other words, if not excluding you are nothing, and so there is not something to hide there is no more than the formlessness of oneness. The animation is grabbed from the web. To include contrasting feelings is not the same as containing them. Inclusion undoes separation and without it, you are not someone definitive. Consequently, there is nobody to contain something. Besides, there is not something to contain, when two sides of a contrast are included, because then they do not appear to be separated anymore. Thus they cannot be experienced as something specific. The first rule of surviving as someone definitive in a world where there seems to be more than one is to exclude something. That is what turns you into someone definitive. Inclusion, on the other hand, does not turn you into anything at all. Someone definitive is needed to include something – but nobody is needed to not perceive something. To follow an idea is to separate, as it takes more than one to follow something. Therefore all ideas – whether so-called spiritual or mundane – must be ignored, if you want to have the belief in separation undone. Yet this is also an idea, and so are any one of the duality hacks except for the enlightenment of that which is one. The duality hacks, however, are not based on the idea of exclusion but inclusion. Hence they do not enhance the belief in separation. They undo it, and without it, you do not appear to be someone definitive hiding there is no more than the formlessness of oneness. NOTE: This article is part of hack #3.1 Inclusiveness is a perfect moment.